Slow cooker Chana Masala – chickpeas cooked in the slow cooker with all the spices! Aromatic, comforting and tastes great with rice or naan! So the clock went back by an hour yesterday. It makes me kind of sad because it starts getting really dark at 4-5 pm and I dislike that. Anyway the clock went back which means holidays are almost here and which also means it’s time to pull out your slow cooker. Now here’s a thing – this is my 1st slow cooker recipe post on the blog! And seriously what better than to share a classic like Chana Masala. This slow cooker chana masala was hands down the tastiest chana masala I have never made. The slow cooking adds so much depth to the flavor. Now why is this my 1st slow cooker recipe, that’s because I didn’t have a slow cooker before! I still don’t have the traditional one but I have an Instant Pot now, which also has a slow cooker option. By the way I am seriously so much in love with my Instant Pot, it’s so amazing! I shared on instagram this one pot pulao which I made all in the Instant Pot over the weekend, so cool. Anyway yeah so right now I am using my slow cooker a lot to make soups and chili. I love the ease and convenience of a slow cooker, you just dump everything and let the slow cooker do the rest. Can’t get easier than that. But this slow cooker chana masala is a little different that way. It has 1 extra step as well, outside the slow cooker – which is the tempering or tadka as call in India. So I slow cook raw chickpeas with all the whole spice overnight and then in the morning, I just cook the onion-tomato masala in a pan and then add that to the slow cooked chickpeas. Technically, yes you can just mix everything together and let slow cooker do all the work. But I am an Indian and I know how important tadka is for our dishes. I think that this extra step is really required to make your chana masala wonderful. Even now the slow cooker does all the work, but you need extra 15 minutes for cooking the masala. 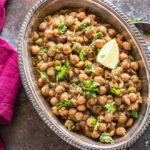 I usually use ghee in my chole recipes but here I have used oil so this recipe is vegan. It’s also naturally gluten-free! This slow cooker chana masala will be a great dish on your Thanksgiving table. It’s so flavorful and your guests will love it. 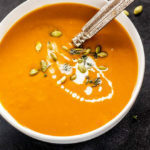 This whole week I will be posting vegetarian thanksgiving recipes and I am hoping you guys will find something that you like. Have a great week ahead! In your slow cooker, add all ingredients listed under “to slow cook”. Give a stir. Slow cook ingredients for 8 hours. I used the slow cook option on my Instant Pot. In the morning, this is how your chickpeas will look. All done and soft. Keep it warm while you make the tempering. Heat oil in a pan. Once hot, add chopped ginger. Saute few seconds till ginger starts turning light golden in color. Add chopped onion, cook for 2-3 mins till raw smell goes away. Add chopped tomatoes and salt. Mix and cook for 5 minutes. Add red chili powder, garam masala, chole masala, cumin powder and mix. Cook for another 6-7 minutes till tomatoes are nicely done and oil starts oozing out from the sides. [you may add 1 tablespoon of water if you think spices will burn while the tomatoes are cooking]. Transfer cooked masala to slow cooker. Add kasuri methi. Also add 1/4 cup water (if required), I did add it. Mix everything. Slow cook again for 2 hours. Add in chopped cilantro and mix. 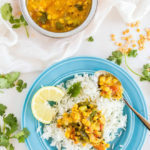 Serve this slow cooker chana masala with rice or bread of your choice. * You can adjust the consistency to taste. Add more water once it has cooked overnight/8 hours if you want a nice curry. I liked it this way – not dry and not too much curry either. 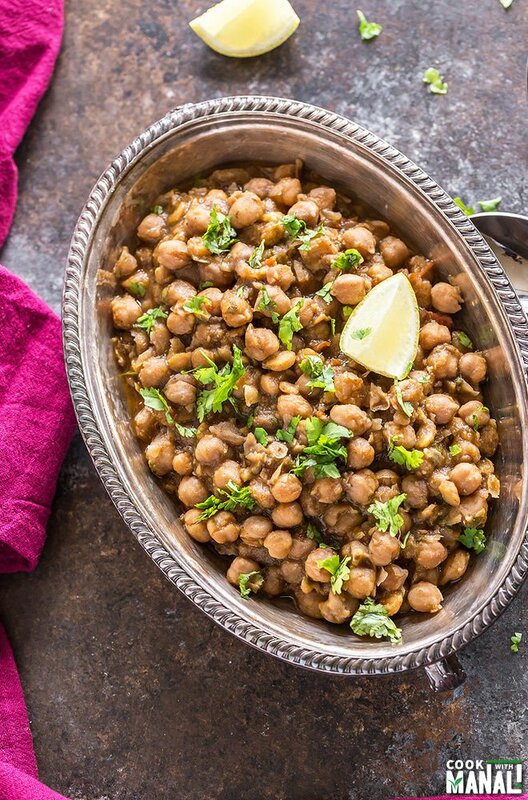 * Chole Masala is a blend of spices used in cooking chickpeas in India. You can find it any Indian grocery store. Raw chickpeas cooked with spices overnight in the slow cooked and then tempered with onion-tomato masala! Really flavorful, vegan & gluten-free! In your slow cooker, add all ingredients listed under "to slow cook". Give a stir. Slow cook ingredients for 8 hours. Transfer cooked masala to slow cooker. Add kasuri methi and 1/4 cup water (if required), Mix everything. Add in chopped cilantro and mix. 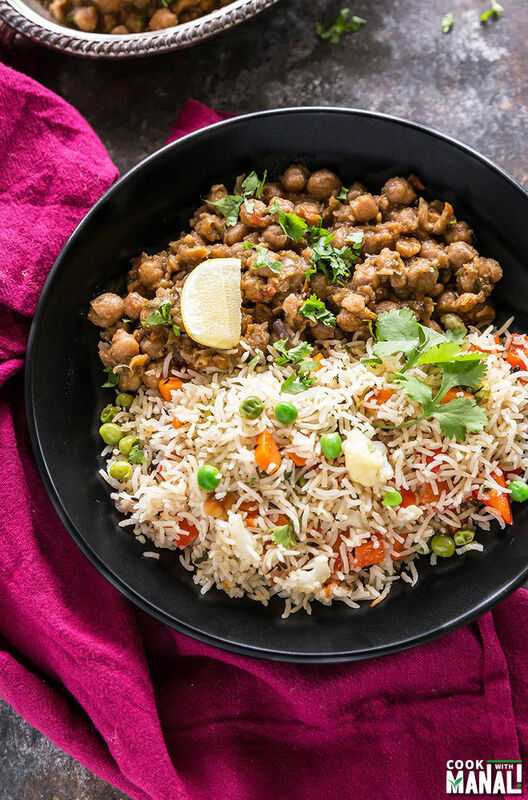 Serve chana masala with rice or any bread of your choice. I am always looking for new ways to use my slow cooker and this looks perfect. I bet all the flavours smell amazing when cooking! 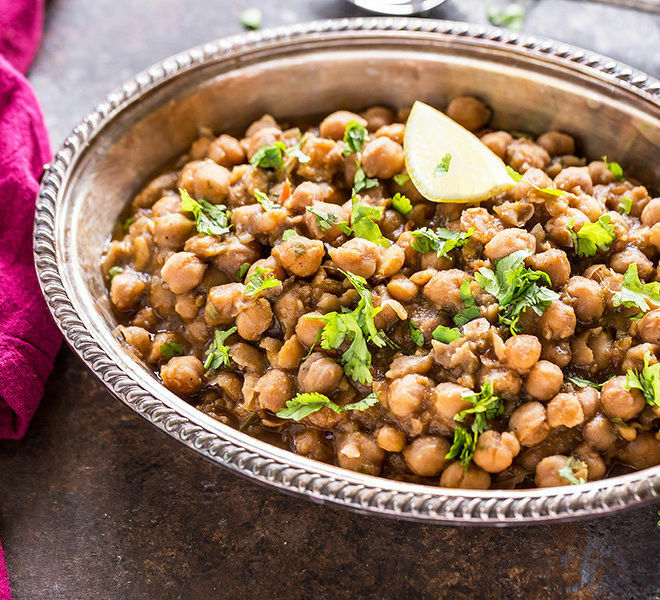 Chana masala is one of my favourite dishes, and I love that this is a slow cooker recipe! It sounds so delicious. Yum! So many amazing spices! Oh man, I just want this entire dinner in my face right now, Manali! Seriously loving how cozy and comforting this looks! Total Monday food done right! 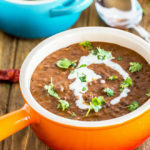 First slow cooker recipe? Awesome! And you picked a good first one, too. I hear ya, though. I had broken my old slow cooker, and I finally got around to getting a new one last year. I can’t say enough good things about slow cookers in the winter! I hope I see some more slow-cooked deliciousness like this during these cold (and dark…bah) winter months! YUM! Seriously I feel like we all break out the crock pots and slow cookers when the winter months hit! This is perfect! I love getting the extra hour of sleep, but I hate that it’s darker earlier! But I think if I had this for dinner, everything would be ok. Looks like perfect comfort food, Manali! Lo got up so early today, but love the idea of an extra hour for sleep! Saw this on FB and it looks fantastic! Pinning to try it! I love chana masala! This looks great! 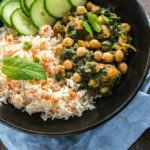 I love chana masala and I love using my slow cooker for weeknight meals. I can’t wait to try this recipe! Hope you like it Stephanie! I tried this recipe on IP. Channa did not cook at all after 8 hours. I used Slow cooker mode for 8 hours under ‘normal’ temperature with the vent open. I am not sure why it did not cook at all. Do you have such experience in using the slow cooker mode in IP? hmm that’s strange..it cooked well for me in the IP the last time I tried it. Let me try again and get back to you! Sorry it didn’t work out. 1. Do you soak the chana and if so for how long? 2. Do you use the Instant Pot lid with venting mode or just use a glass lid when using the slow cook function on the Instant Pot? 1. I don’t soak the chana..but I have heard some people have problems when they don’t soak it. So you make soak it for 4-5 hours. 2. You may use a glass lid on slow cooker mode…IP lid will also work in venting position. My chole were too hard even after the 8 hours on slow cook (from your photos, I gauged that we have the same IP). Did you face this problem on a repeat try? Hmm I will have re-check this..will let you know Ishita! Is there a certain brand of chana masala blend that you recommend?